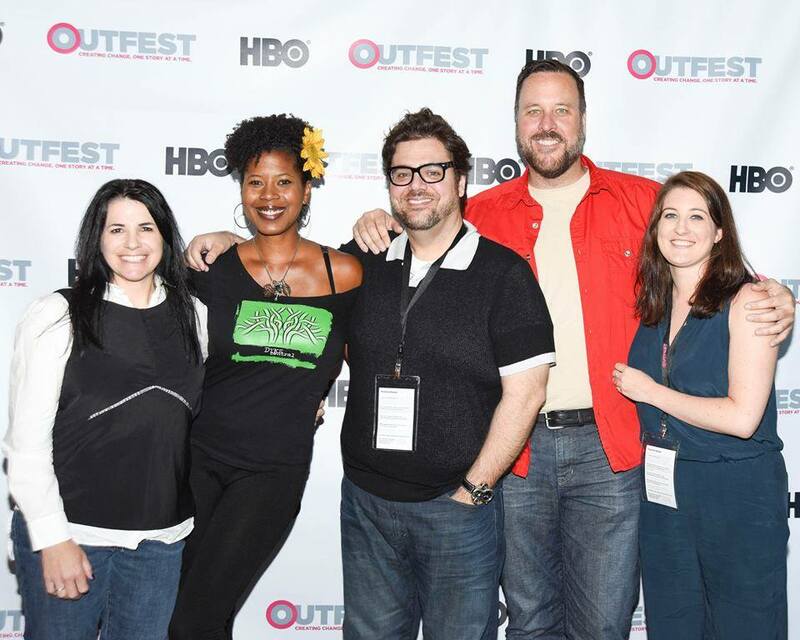 Christina and I were invited to participate in the In With The New Out panel at Outfest, which was a huge deal since Outfest is the leading organization that promotes what they see as equality by creating, sharing and protecting LGBT stories on the screen. The panel was, as always, very fun and OutFest was very well attended, which made for a full audience with lots of positive energy. Screening 'Kelsey' on such a big screen and getting the audience response was a necessary reminder of why I love to create, why it's so important to keep going and that the payoff doesn't always (actually quite rarely) come in the form of financial gratification but the joy and participation of those who consume our content. For one and a half hours, the duration of the panel, my self-doubt had gone on vacation and I thoroughly enjoyed the positive energy of the room. I got to hang out with wonderful filmmakers on and off the panel, some I had met before, others I now consider new friends. After the panel some of us grabbed lunch and discussed the film industry and LA in general. It was a short but wonderful time and I hope to go again next year (with Christina). Don't walk -- especially if you're not wearing sunscreen. If you're getting into a car service, be prepared to talk. AirBnB is cheap and effective and less scary than initially feared. Everyone is struggling to finance their content. The sun will burn you through your car window and leave you with one side of your face more freckled than the other. Don't buy breakfast at the airport (what was I thinking?!) they'll charge you a liver and a kidney. We'll keep you updated on the next few panels. (Last year we were at Cinema Q & the Seattle Lesbian & Gay Film Festival). 'Kelsey' will be screening in Dublin next at the GAZE Film Festival! Tonight, episode 9 of 'Kelsey' screens at this cool free screening & fundraiser! Come on by to watch some hilarious web series by other local female content creators and support a good cause! Listen live tomorrow at 2pm for Christina as the special guest on the new radio show 'Make Art Make Money.' She'll be talking about 'Kelsey' & how we got as much attention for it as we did. Streaming link coming soon. Film review site Screen Nut featured SUMMIT last week and said some cool things about our teaser trailer for the film. The wonderfully supportive site creator Mike Holden then invited Christina to do a Q&A about the film & her work in general. Give it a read HERE. As a reward for our recent Crowdfunding campaign, we promised supporters that they'd get our outline for what would have been Seasons 2 & 3 of Kelsey, had it continued, along with the would-be Series Finale script. We're keeping the script exclusive to the campaign supporters, but we decided to share the breakdown of the would-be seasons with the rest of the series fans. Enjoy! Our original plan for Kelsey was to have 3 seasons. We went in expecting to do 3 - no more, no less - assuming the series found an audience. As you all know, it did find an audience, but continuing past a first season just wasn’t in the cards for us (http://www.congestedcat.com/blog/2014/4/8/christina-kelsey-talk-kelsey-whats-next). That said, we did do a lot of planning for what the series would have turned into, and are proud to be able to share it with you. We hadn’t worked out all the details, but had seasonal arcs & storylines for each character. We would have jumped 3 months from the season 1 finale, explaining that Kelsey took a stand and chose Joanne, asking Shane to leave and not contact her or her friends. Joanne gets over the incident and she and Kelsey are happily in love for a couple of episodes until they start discussing where their lives are headed. Joanne’s character is developed more throughout the season. She’s in school and has literary aspirations. A rift in their relationship is planted early on and grows as the season progresses. Joanne is very determined and, in her final year of Grad school, often busy working and writing. Kelsey becomes annoyed with Joanne for never being available to go out. Joanne becomes frustrated because Kelsey doesn’t understand why planning for the future is so important to her. She points out Kelsey’s lack of direction and it becomes apparent to both of them that Kelsey’s wishy-washy nature doesn’t pair well with Joanne’s plans for herself. They end up breaking up. It ends mutually, realizing maybe it’s not them but the timing that’s not right. Sam & Rowan adjust to really just being friends. We were very against on-and-off relationships; we definitely wanted to firmly keep them off. Rowan would settle into domesticity with Kate and be surprised that he was happy about it. He would continue to grow as a person and have revelations about what it means to be in a good relationship with open communication, which at times could sound preachy, but the others would accept him. Sam expands on the business front. She becomes boss to a whole group of employees and ends up dating one of them. This turns into a serious relationship throughout season 2 despite her initial distaste for him (keeping in line with her type). Tyrone would go through a dating phase, where he’d sleep with a new man every week. He considered this the path to finding himself but continuously feels emptier. By mid-season, he would go into a dry spell and decide to study religion, to humorous effect. He would not end up with anyone by the end of season 2. The season would end with Kelsey attempting to find a hobby by doing something with each of her friends to no avail: yoga with Tyrone, jogging with Rowan, kickboxing with Sam. It would end with her doodling to pass the time and realizing she’s always loved drawing. This was a seed we planted in season one with her doodles all over her office and bedroom. Fun Bonus: We had one fun idea for a 3 episode arc towards the middle of the season where Sam, Rowan & Tyrone would meet up at the bar without Kelsey, not knowing what she’s up to, and end up telling stories about what they did yesterday. In each story, Kelsey would make an appearance. What happened for her that day and ultimately where she is at the moment of them all meeting up would only become clear through the combination of her appearances in each of their stories. We unfortunately didn’t get to flesh this out further, but believe it would have been a ton of fun to do. Interestingly, this idea was conceived before Arrested Development season 4 premiered on Netflix. If you’re a fan as we are, you can imagine that we were not disappointed, but rather elated that we had come up with such a similar creative-structure to that of those brilliant writers. Kelsey would have relationships with women that weren’t perfect and they’d usually end in Kelsey getting the fade away. Showing growth, she would not be too bothered by it. By mid-season, she’d meet Carol, who would have been in three episodes. They’d get along and have chemistry but Kelsey would realize that she has a lot of growing to do and Carol is not the one. She ‘d substitute her need for love with the passion she’s found in drawing. By season’s end, she would get hired by a creative agency and actually flourish in the new environment. Rowan would accidentally get Kate pregnant and they’d decide to keep the baby since Kate is very financially stable and ready. She and Rowan would decide that he would be the stay at home parent. Many jokes would come out of the group’s reaction to how much Rowan has changed, for the better. Sam would break up with her boyfriend and casually date another guy throughout the season. She’d get promoted again within her company to Marketing Manager, which would force her to consider moving to the West Coast. After a pro and cons episode, she’d decide its best if she goes, and Kelsey would have to come to terms with it. Tyrone would meet the man of his dreams at Kelsey’s new job. Fearing he’s been replaced, he would follow her to happy hour after a workday to meet her new coworkers. It would turn out that the guy she had befriended is just enough like Tyrone that they hit it off. By the finale, Kelsey would get her own studio apartment and learn what it means to be okay with being by herself. Christina wrote about the unique look & feel of the series/1st season in her ‘Directing Kelsey’ series on our blog. Feel free to give that a read here: http://www.congestedcat.com/blog/?category=Directing+Kelsey. Season 2 would have been firmly planted in the present, with no more flashbacks/camera-slides to the past. This would have meant a big shift for viewers of the show (though not unfamiliar since we toyed with it in Episode 9 of the series), but a necessary change to represent Kelsey’s ability to finally live in the present. An exception to no longer doing flashbacks would have been the 3-episode arc towards the middle of the season, (discussed above) involving the 3 supporting characters. It’d be a fun throwback to the 1st season and Kelsey’s story-telling nature. Christina & Peter (our DP) were still in talks about how they’d progress the look of the show in Season 2 when the decision was made not to continue. However, since the motif of working up to tighter shots and lenses was no longer a constraint, they discussed the varying ways they could show the deterioration of Kelsey & Joanne’s relationship, a lot of which revolved around creating physical distance and strategically placed barriers between them as the season progressed. (For instance, using furniture or literal dividers like doorways, to separate them within shots.) The show would retain its warm, intimate look both in shot construction and color tone. Season 3 on the other hand would focus quite a bit on the future. In fact, it would spend much of the season flash-forwarding to Kelsey breaking up with Carol, specifically Kelsey doing the dumping. The season would have brought back the camera-slides of the first season, but always sliding into the future. It would still feel warm, but with a little less of a sitcom glow to it. It’d grow up, so to speak. It’d look a little more cinematic and have more blues (over its original orange-hue) incorporated. This would have been to create a sense of finality, while retaining an openness to future possibilities. The motif of progressing the color tone over the course of the season, basically working its way up to the look of the flash-forwards, was discussed and likely would have been one of the more noticeable shifts of the series, most reflecting of it coming to a close.